As mentioned yesterday, the Keyed Up earrings in Marilee Rockley's new book "Tatted Jewelry" were shouting to be made straight away. I really like the shape of them, perfectly balanced. In the book, one sample pair has little keys dangling from them, hence the name, but I didn't have any and anyway, I love pearls so I added freshwater pearls on mine and silver-lined seed beads on the centre ring. And I tatted these FSBS! I figured that they would always be seen from the front so this would be one circumstance where FSBS is worth it. Your earrings look so beautiful with that freshwater pearl! 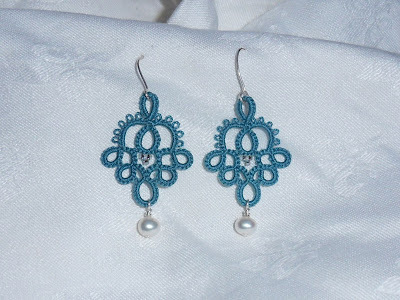 The pattern, your tatting and the end result are ALL perfection. Those are really lovely...beautifully tatted, and an exquisite pattern! The color you chose and the pearl just adds to the perfection. I'm a pearl girl, so the pearl jumped right out at me! You did a beautiful job with Marilee's pattern. I've been thinking a lot about fs/bs tatting lately. Maybe I'll give it a try again to see if I can keep it all straight. Thanks for the inspiration! Very beautiful, great choice of color of thread and beads!